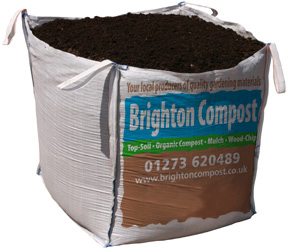 Only Â£59.95 Bulk half ton bag Includes free local delivery! Only Â£54.95 each if you order two bags! This big bulk bag of rotted horse manure at just under a cubic meter (about half a ton). The best value around at only Â£54.99 Delivered. This bag is ideal for boosting nutrition to your fruit and vegetable garden or allotment.. Collected only from carefully selected local stables that are known to us and left to mature for a good period. This manure is from clean grass fed horses, not from racing stables with high antibiotic / drug use. it is an excellent 'old fashioned' manure. It is a product very high in plant food. Â£4.95 per 40 litre bag - minimum order x10 bags or mix and match with any of other of our bagged products.